Boombox Brewstreet went for a makeover and came back with large breweries and a completely new menu, but one thing that hasn’t changed is its connection with music! Located in the brew hub of Gurugram, Boombox is pretty easy to spot. The interiors are tastefully done, well in-sync with their concept and a complete haven for music junkies; the bar is the highlight of the place with a giant boombox background and vintage mics. Cool! Ever since its makeover, Boombox has created quite a buzz in the market, so we dropped by to sip on their freshly brewed beer and hog on some of the dishes from their very quirky and talked-about menu. The name of every dish is inspired by a new or old song while subtly giving a hint of the dish. 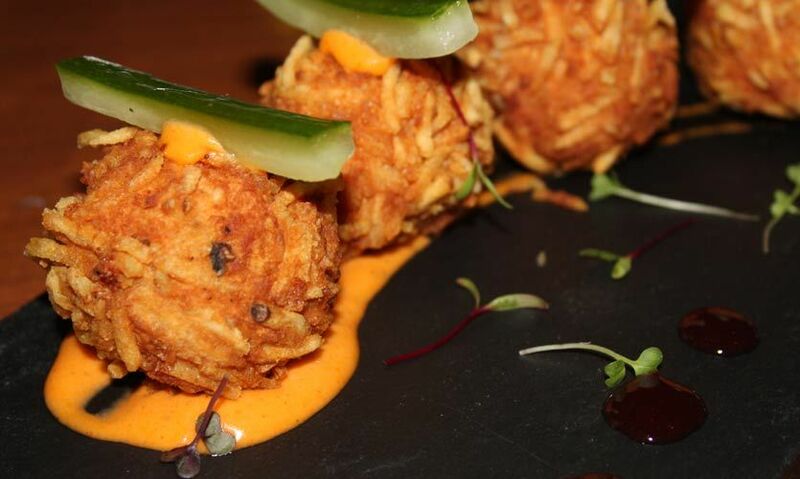 The menu is massive and every dish on the menu is lip smacking, but here are some of the dishes and drinks you must not miss on your next visit! A perfect amalgamation of peanut butter jam and paneer bread pakoda (yes, really! ); Paneer Bread and Jam defines a new dish in the bread pakoda sphere! Pairing paneer bread pakoda with jam was a little odd for us, but it took just one bite for us to fall in love. The sweet and salty flavours go so well with each other! Trust us guys, you must come and try this combo sometime. Chilli potato, chilli dust and honey caviar! 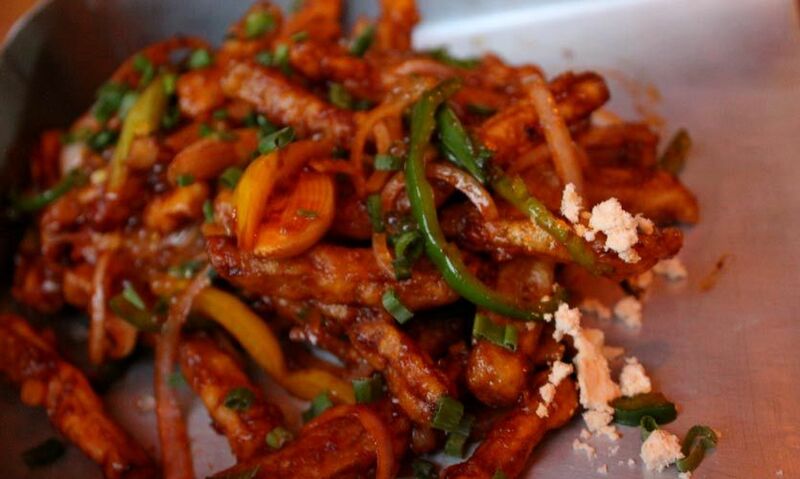 This one’s a fancy, upgraded version of everyone’s favourite honey chilli potato. You won’t find any regular or mundane dishes on the menu; this was probably the only dish that was an exception to this policy. Crisp potato strips tossed with bell peppers and onions with chilli dust was absolutely delicious, and the use of honey caviar instead of just drizzling honey over the dish is the game changer. Because of the caviar, the potatoes didn’t get soggy nor were they too sweet. This was an interesting dish which brings to you a bit of all the three destinations in a single platter. Rajma chawal croquettes laid upon a sabudana papad was served with anar raita. The shape of rajma chawal was inspired from Spain, while rest of the dish was Indian in every sense. 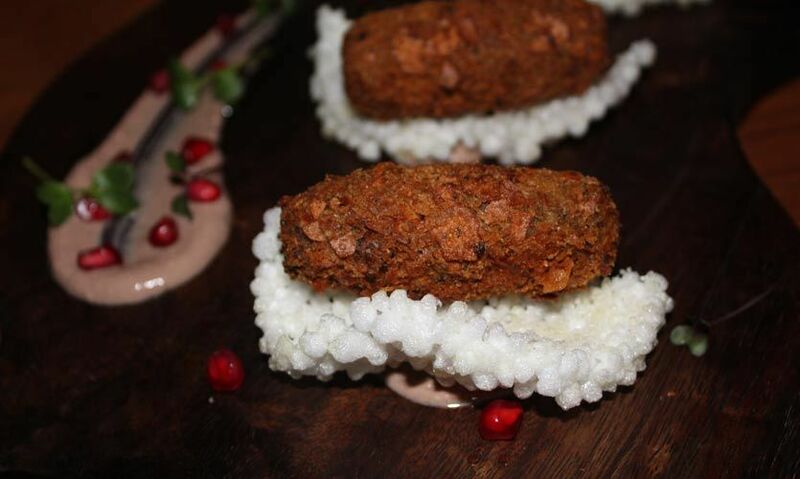 We’ve always loved rajma chawal, so this new way of presenting and eating it gets a thumbs up from us! 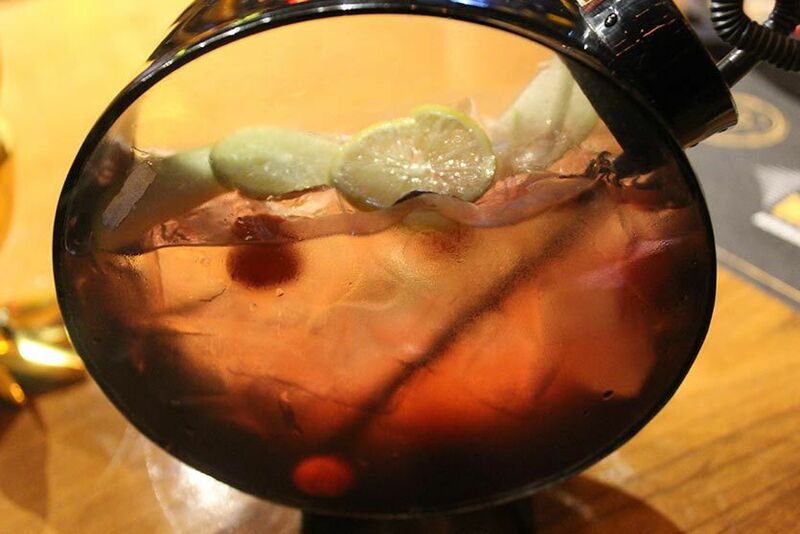 A little milder version of LIIT, we loved the combination of spirits in this one. The drink was mostly dominated by raspberry and cherry flavour, which proved to be a respite from the usual, strong LIITs. Also, the presentation is so beautiful, we felt as if we were drinking out of an aquarium, the container can be cumbersome but a little presentation and the taste makes it well worth it! Another great drink from the cocktail section with yet another quirky presentation was their Summer Lime Thyme. The drink is presented in a pineapple-shaped container which makes for a good conversation starter! 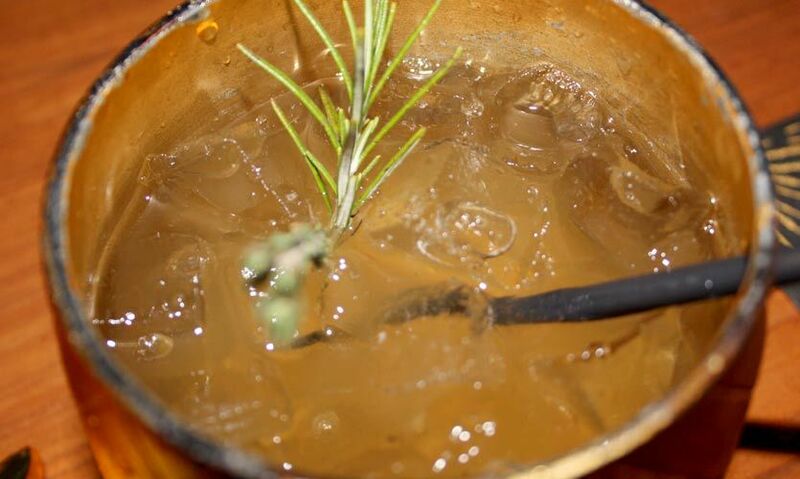 As far as the drink is concerned, it was sweet with a very pleasant aroma of thyme. 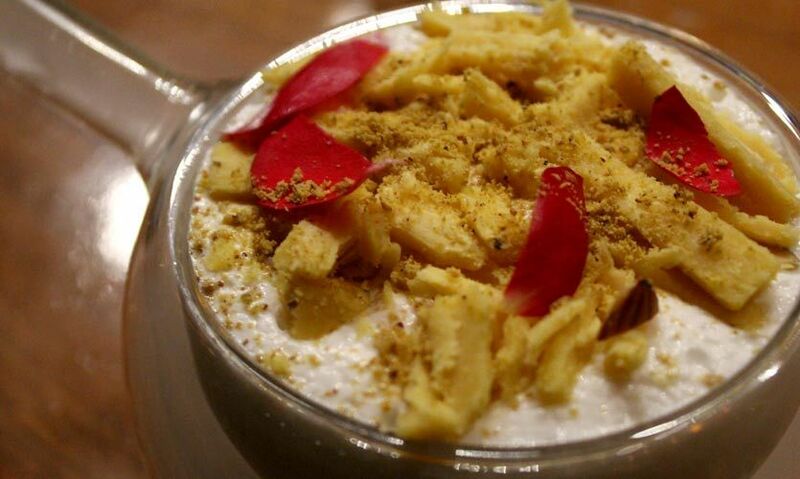 A famous dessert straight from the lanes of Chandni Chowk! 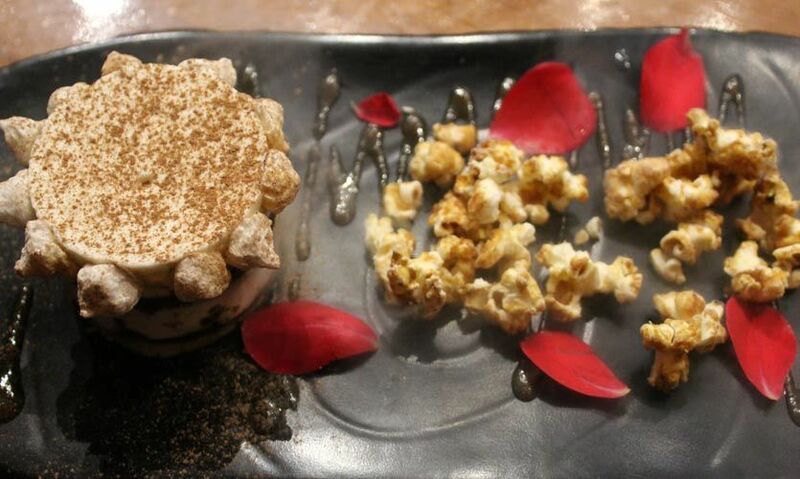 Boombox has managed to capture the very essence of this dessert; the rich froth and the added pitasa or soan papdi upon which some roasted almonds and rose petals were sprinkled. The dessert is so light and so delicious, trust us one won’t be enough! Paamisu is what they call it! The popular Italian dessert was taken for an Indian spin and we got paanmisu. The dessert has layers of gorgeous flavours; rasgulla, gulkand and hint of coffee are what you’ll find in this dessert. The freshness of paan and gulkand is the perfect ending for any meal, so don’t miss this one! We absolutely love this new and better version of Boombox and we’re sure you will agree with us too - just come on by!